In the mood for authentic Italian food? Order scrumptious pasta, arancini, salads, pizza from a Salt Meats Cheese restaurant near you. Get Salt Meats Cheese delivered to your door! Family-owned Italian restaurant group Salt Meats Cheese is all about using quality ingredients and recreating classic Italian dishes, but with a modern Australian twist. 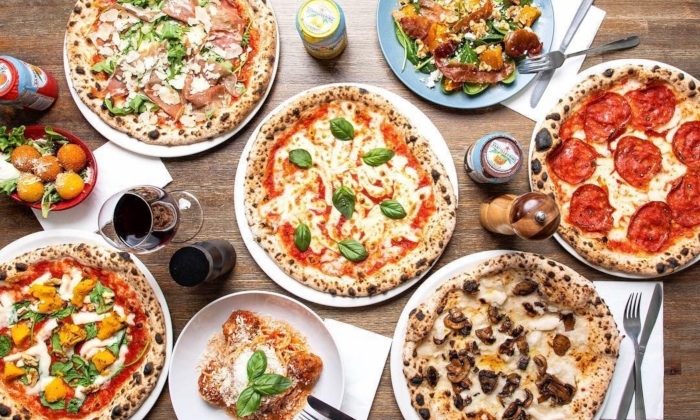 You don’t need to go to Italy to enjoy authentic nosh, such as pasta, arancini, calamari, salads, pizza – and of course meats! Who said takeaway can’t be an incredible, top-quality experience? You don’t need to go out to indulge in a restaurant quality meal, Menulog makes it easy to order your favourite Italian food from Salt Meats Cheese restaurants, Planning on having a romantic night in? Menulog can have your beautifully prepared meal delivered to your home. All you have to do is create the ambiance. We suggest a few candles and nice bottle of wine. That’s amore! Have you tried the Flaming Cheese Wheel Pasta or the indulgent 10 Cheese Pizza? How about the Gnocchetti Alla Sorrentina or the meatball? There’s no need to leave your home when Menulog can get your dinner (or cater your next dinner party) sorted in minutes. Salt Meats Cheese has a wide range of dishes that will have your dinner guests wondering how long you spent cooking in a hot kitchen. We won’t tell if you don’t!